trees cast shadows by starlight. Even dog stares into illuminated stillness. spilling light into our darkness. cold calling us from four corners. NOTE FROM THE AUTHOR: The raw and desolate beauty of Vermont winter and stunning night sky, as with anything so exquisite, are beyond the grasp of words. Perhaps only in painting with words, such as poetry, can we even hope to evoke the experience. 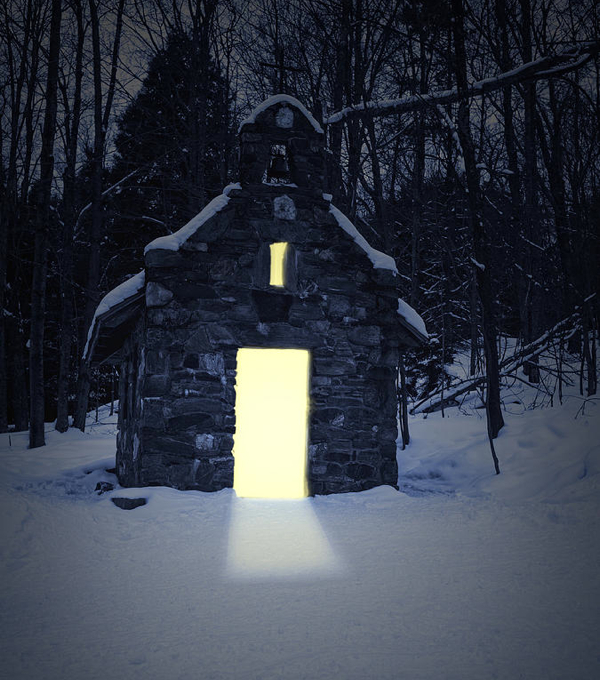 IMAGE: “”Snowy Chapel at Night”(Little Stone Chapel built in 1950 by Werner von Trapp, Stowe, Vermont) by Edward Fielding. Prints available at fineartamerica.com. ABOUT THE AUTHOR: Cameron Miller is a Hoosier by birth, a preacher by profession, and an author by vocation. He is the writer behind the curtain at www.subversivepreacher.org, and has also written professionally as a columnist and storyteller. Recently he traded fulltime parish ministry for writing fiction, poetry, and spiritual reflections while also relocating to the fabled Northeast Kingdom of Vermont. He has a poem included in the “I Am Waiting” Series on Silver Birch Press, with more poems appearing in upcoming anthologies by Eyewear Press and Inwood Indiana Press. Thanks – nothing like frigid cold to awaken the senses!